Do You Care If Your Fish Dinner Was Raised Humanely? Animal Advocates Say You Should : The Salt Concerns over animal welfare have led to changes in recent years in how livestock are raised. But seafood has been missing from the conversation. One group aims to change that. Fresh fish fillets for sale in a display case. Concerns over animal welfare have led to changes in recent years in raising livestock. But seafood has been missing from the conversation. One group aims to change that. At some point or another, we've all cringed at the videos: lame cows struggling to stand; egg-laying hens squeezed into small, stacked cages; hogs confined to gestation crates, unable to walk or turn. Over the past decade, animal advocates have made great strides informing us of some of the problems with how many of our favorite proteins are raised. They've also made progress bringing change to the industry by pressuring large-scale retailers — from Target to McDonald's — to commit to sourcing livestock raised with higher welfare standards. But one important protein source has been missing almost entirely from the conversation: seafood. Mercy for Animals, a U.S.-based animal welfare group, says that's about to change. The group says it is beginning to lay the groundwork for a campaign that will target the aquaculture industry and shine a light on the conditions in which finfish like salmon, tilapia, catfish, trout, pangasius and other species are raised. "More and more fish are being farmed in intense factory farms," says Nick Cooney, executive vice president at Mercy for Animals. "At the same time, there's an increasing amount of research discovering just how intelligent and social fish are as individuals." Do consumers care? Mercy for Animals' own in-house studies suggest yes — and offer a roadmap of the objections the group is likely to raise with the aquaculture industry. Concerns like too many fish routinely crammed into pens and tanks, fish being raised in dirty water, high disease and mortality rates. The group, a vegan organization, also cites slaughter methods it finds most inhumane — like letting fish suffocate in open air, chilling them while still alive, or cutting their gills without stunning. And then there's the parasites known as sea lice, which feed on farmed salmon, costing the industry nearly $1 billion a year in losses. "For individual consumers, our goal is simply to educate them on the way these animals are being treated," says Cooney. "Our research studies have found that when people learn about these things — that half the fish being used in the food industry are coming from factory farms, or are confined in tanks with dirty water; that sea lice eats away the flesh and faces of fish — that educating them leads to more compassionate choices. And for large companies, our hope in the coming years is that if we show them their customers care, they'll eliminate the worst practices in their supply chains." Mercy for Animals may have one important thing going for it — timing. Humane treatment of fish is a topic that's starting to bubble up elsewhere. Seafood industry gatherings like the Seafood Summit and the American Fisheries Society meetings are now including sessions focused on welfare issues for farm-raised fish. Supermarkets like Whole Foods are addressing the issue by including language in their seafood standards requiring producers to minimize stress, and have gone so far as to stop carrying live lobster in their stores. And in Seattle, a pair of commercial fishermen recently launched a new fishing vessel that they claim is designed to humanely harvest the wild Pacific cod they catch. But will eaters care what fish feel? Industry representatives say they paid close attention when animal advocacy groups went after the egg-laying hen and hog industries, but say they aren't convinced eaters will prioritize humane treatment for fish in the same way. "I'm not sure fish will capture the conscience of the public in the same way warm-blooded, furry animals have. People in this country don't see fish as sentient animals, with a conscience requiring the same welfare standards they'd give to a brown-eyed calf," says Craig Watson, who chairs the aquatic animal welfare committee for the National Aquaculture Association (NAA), a U.S.-based group of seafood growers. But it's a topic many in aquaculture are thinking more about, including veterinarian Stephen Frattini, president of the Center for Aquatic Animal Research and Management, who has spoken about fish welfare at industry conferences. "As humans, we've utilized terrestrial animals as food, but also to pull carts and plow fields. And along the way, a moral contract evolved that acknowledged we should provide for them in a way beyond not being cruel to them," Frattini says. "But with fish, we're not there yet. We [as eaters] have yet to really struggle with that." Indeed, defining what constitutes humane treatment of fish may be a tricky proposition of its own. For one thing, the debate over whether fish are sentient and feel pain is far from settled. "It depends on who you talk to," says Watson, who also runs the Tropical Aquaculture Laboratory at the University of Florida. He says he and many others think "the science is clear that fish lack the neurophysiology to feel pain. They don't have the brain structure — a developed neocortex where pain occurs in higher vertebrates." Watson notes the growing body of literature suggesting that there's a part of a fish's brain that can feel pain or emotion. But he says the science is still pretty clear. "Fish don't have the equipment for higher processes similar to ours." But in a way, he says, the answer almost doesn't matter. "To me, it's not an argument of whether fish are emotional and conscious, that's a personal belief in many ways. What's important is the welfare of the animal." What constitutes humane treatment for fish? But what's deemed humane for one species of fish may be detrimental to another. For example, imposing an across-the-board, low-density requirement might actually create a stressful environment for certain species. Tilapia or arctic char can become aggressive with each other when there are fewer fish in the pen. And then there are fuzzier welfare issues. Are breeding techniques that sometimes result in skeletal deformities a humane issue? What about emerging evidence that accelerated growth rates of some farmed fish have resulted in hearing loss? For some farmed salmon, sea lice are more than just uncomfortable parasites that attach to fish and feed on them—unchecked, they can be deadly and can also infect wild salmon swimming nearby. Last year in Scotland alone, 10 million salmon were destroyed because of parasites, diseases and other problems. Should high mortality rates like that be viewed through a humane lens? "It's not how many fish you put in the pen, it's how many you harvest. There are a lot of farmed fish that never make it to the plate because of mishaps during the farming process," says George Leonard, chief scientist at Ocean Conservancy. "Should we as a society care about the suffering of those fish that never make it to the plate? That isn't a science question. That is a moral question." The issue is on the radar of industry certification groups like Best Aquaculture Practices, which includes an entire section on animal health and welfare in its standards. The Aquaculture Stewardship Council says welfare provisions are included in its current standards to address issues like stocking densities and veterinary care, but it does not have a separate standard for the 12 species it currently certifies. The National Aquaculture Association's official policy on animal welfare also encourages humane practices including quick slaughter, though it specifically warns against anthropomorphizing standards around pain or intelligence. "What concerns people like me is the Mercy for Animal groups don't understand the fundamental biology of these animals, yet they want to dictate to us how to best grow the fish," says Randy MacMillian, an NAA board member and vice president of Clear Springs Foods, an Idaho-based trout farm. "As fish farmers, our mission is to provide U.S. consumers with environmentally sustainable, wholesome, high-quality seafood at affordable prices. We have to look at husbandry conditions. We're looking at feed conversion [the amount of feed it takes to grow one pound of fish], mortality, morbidity — and we use those metrics to inform us if we're doing a good job," he says. Mercy for Animals will have some daunting hurdles in its path as it tries to shift the aquaculture industry: The vast majority of the farmed fish Americans eat comes from countries like China, Indonesia, Canada, Norway, Chile and Ecuador. "Welfare rights are primarily a Western phenomenon," says Fred Conte, an extension aquaculture specialist with the University of California, Davis. "You go to Central America or China and you're not going to find welfare standards." 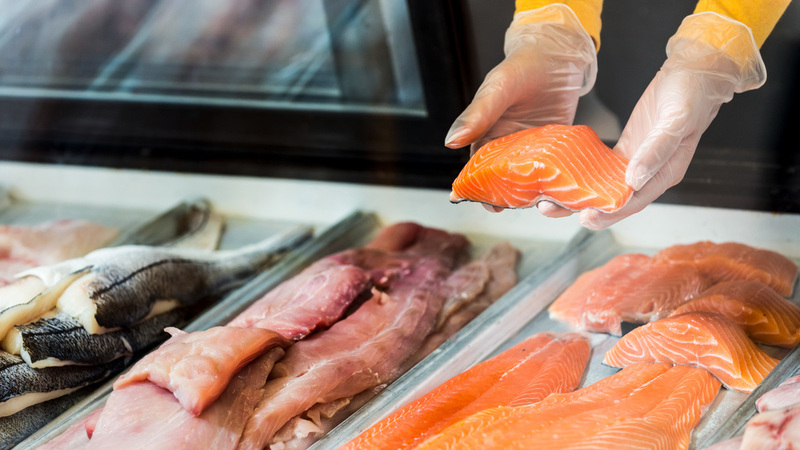 And many consumers already feel overwhelmed and confused with the complex decisions they face at the seafood counter: Is the fish farmed or wild? Is it from a sustainable source? Does it contain mercury or other contaminants? Was slave labor used in its production? Is the label accurate — or has that snapper been swapped for something else along the way? Adding the question, "Was this fish farmed humanely?" might be a tough sell. Conte says ultimately, society will decide whether to take up the humane treatment of fish. "Right now, no one can make the definitive statement: Fish feel pain like humans feel pain. It's an open debate," says Conte. "Before science comes up with that evidence, society is going to move in a direction. Industry will respond to market pressures. If society chooses not to believe a fish feels pain, there will not be much pressure on the industry." Clare Leschin-Hoar is a journalist based in San Diego who covers food policy and sustainability issues. This story was produced in collaboration with the Food & Environment Reporting Network, a non-profit, investigative news organization.